A very interesting article appeared by that unknown entity called Sorcha Faal, AKA whomever, that appears to be telling us something that was confirmed by the Duck Dynasty family members themselves – that Phil was set up, and the article claims by orders from Obama himself, who always says one thing but means the opposite, that is, HE LIES and who also hates Christians. Watch what he does, not what he says. Offense? We are all offended at one time or another, it is what it is, grow up, live with it – but cannot anyone understand what is really going on here? This is the classic method of eliminating free speech, brand it all hate speech – you cannot offend anyone – therefore shut up and only the Government can say what it wants – but you cannot. Either we have total responsible free speech or we have none. The greatest offense for the human race is soon coming – when they stand before their creator, who they mocked, and are sent away. That IS offense. A&E along with the History Channel and most of TV appear to be ANTICHRIST to their core – they mock the Bible at every chance they get and in as many ways as they can – all the while attempting to claim these Bible documentaries are “truth telling documentaries” to explain the “mysteries of the Bible” when in fact they total distort the Bible at almost every turn. It is a fulfillment of prophecy. So now we have to ask a question – how is it that all of this hatred for Jesus Christ and the Bible arises so rapidly in the last days unless it is willful on the part of antichrist forces – who control all major media and all of whom, according to Psalm Two hate the Father, the Son, and the Holy Ghost. I don’t hear a lot about Psalm Two in modern prophetic circles or general “churchianity, like it does not exist or something. No one seems interested in it. Like it has been redacted. Psalm Two is the very foundation for all latter day prophecy and is of extreme importance to understand what it says and the ramifications of it, and the ripple effects of it in all of human society, because we are watching it unfold rapidly now. Duck Dynasty was, it appears, willfully set up to ridicule and mock Christianity. This is how the Psalm Two war is fought. Select out people who believe in Jesus Christ and the Bible, and then point out how stupid they look, the clothing they wear, how “unconventional they are, how they look so backwards and just “don’t fit in” with the mainstream of people, etc. And of course, they have “guns” and “religion” and they pray and say grace over meals. How awful and backwards these “Duck Dynasty” people are. That’s the real message. It is subtle, but then again, Satan is “subtle” is he not? “A curious report written by the Ministry of Foreign Affairs (MoF) circulating in the Kremlin today is describing what can only be termed as a Kafkaesque [having a nightmarishly complex, bizarre, or illogical quality] Plot instigated by United States President Barack Obama this past November to “destroy” an American reality television programme called the Duck Dynasty. According to this report, on 21 November, Obama hosted a number of high profile liberal journalists to an off-the-record meeting in the White House where the subject of the American celebrity chef and cooking show television host Paula Deen was discussed, particularly the left-wing medias involvement in destroying her reputation and multi-million dollar business over alleged racial remarksshe was said to have made and that surfaced in June 2013 during a US Court case that was ultimately dismissed in August 2013 proving her innocence. Russian diplomats stationed in Washington D.C. quoted in this MoF report (who are regular visitors on what is loosely called the Georgetown Party Circuit) further report that during Obama’s November meeting with these left wing media supporters he “openly wondered” if the same tactics used against Deen could also take down the “Big Duck,” a slang reference used by these media elites to denote the Duck Dynasty programme. Obama’s wholesale abandonment of Christians, this report continues, is not only against those in America, but also against the thousands of Christians being slaughtered in Syria by the Islamic rebels his regime supports and his left wing media apologists continue to ignore. The main supporter behind Obama’s “instigated plot” to destroy the Duck Dynasty programme, this report states, was Kevin Brockman, Executive Vice President of Global Communications for Disney/ABC Television Group, and who this past May (2013) was elected Chairman of the Board of GLSEN, the Gay, Lesbian & Straight Education Network. Anne Sweeney, this report continues, is the most powerful women in US television history and as Co-Chair of Disney Media and President of the Disney–ABC Television Group donated hundreds of thousands of dollars to Obama’s reelection campaign and jointly owns with the Hearst Corporation mass media group the A&E television network the Duck Dynasty programme appears on. According to “cocktail chatter” overheard by Russian diplomats in Washington D.C. these past few weeks regarding Brockman, this report further states, this most powerful of television executives has made it his “personal mission” to destroy the Duck Dynasty programme due to his and Obama’s belief that all objections to homosexuals and their lifestyles, and all references to Christianity must be obliterated from American mass media exposure and popular culture forever. What has made the Duck Dynasty programme a target for the rabidly pro-homosexual Brockman and his anti-Christian agenda, MoF experts in this report say, were the rapidly rising numbers of Americans flocking to this basically wholesome Christian and family based television show that is currently averaging an incredible 14.6 million viewers (when including seven days of DVR playback) thus making it one of the top 6 TV programmes in all of the United States. To the exact faux social uproar instigated by Brockman against the Duck Dynasty programme, this report says, involves comments made by this television families patriarch, Phil Robertson, simply stating the Christian religious belief that homosexuality is a sin; a common view that is shared by nearly half of all Americans, including those of the Jewish and Islamic faiths too. MoF experts in this report state that the answer to that question is “chillingly obvious” in that the Obama regime and its left-wing media allies, like Brockman, are following the script written by the Nazi German regime of last century on how to demonize and ostracize an entire religious belief system; which in the former culminated in the vile 1940 anti-Semitic film The Eternal Jew depicting those of Jewish belief as vermin, and in the latter depicting normal American Christians, like the Duck Dynasty family, as unwashed, uneducated, bigoted vile human beings only worthy of scorn and ridicule. So is this article true or false, made up disinformation or is there truth buried here? When you couple all of this with comments from the family itself – well it does appear as a set-up and that the family was simply not aware of how dirty, how filthy and underhanded media can be – you cannot, you must not ever believe them or what they tell you. They have an agenda, a plan, it is called ANTICHRIST. I found out early on the antichrist nature of major media – when we produced Iron Mountain. You have to understand that the Bible is considered by most governments the world over as being a book of intolerance and bigotry. They have a valid belief there – it is a book that has ONE PLAN, ONE AGENDA, and ONE POINT OF VIEW. It makes no bones about mankind’s fallen nature and rebellion. It does not make any apologies for that stance – If God is, then He has a point of view, and because mankind is a fallen creature and full of unconscious and sometimes very conscious hatred for God, then what other point of view would the governors of the world have? Psalm Two is, as always, totally correct. There is a WORLD WIDE CONSPIRACY against Jesus Christ. There is a rapidly growing hatred for Christians and Christianity around the world. From schools removing any reference of Christmas from “Solstice Holidays” to removing the name of Jesus in songs like “Silent Night”, this unadulterated hatred for the Creator is now becoming very obvious. It is a fulfillment of prophecy. THE SPIRIT OF ANTICHRIST IS RISING AROUND THE WORLD, in local, county, state and federal government, especially in America. It is no accident. It is willful and deliberate. Get ready, brace yourself, the battle is on. Now all of this is based upon not “offending” those that don’t believe in Jesus Christ. It is OK to offend the Christians by removing all reference to it, but please do not offend homosexuals, the GLBT community, the Moslems, or anyone else – because you might offend them in some way, hurt their tender feelings. If you offend them, you are full of hatred and you are a bigot, filled with hatred and deserve the harshest of judgment. All of this is MASONIC TO THE CORE, it is in their manual “A Bridge to Light”. There is no knowable truth, so there is no sin, and there there is no right to “judge”. However, offending Christians is not only OK, it is now openly advocated. Why cannot people see what is really happening here, the Psalm Two War is on – it is right under your nose. The Duck Dynasty “offense” proves the total and absolute hatred for the Bible itself as well. After all, the views expressed by Phil are what the Bible says in many different ways. So what’s the problem? DO NOT TELL THE TRUTH. Having itching ears, the entire world is turning away, and embracing lies and fairy tales. Was a time when the word “GAY”, for example, meant you were happy. Orwellian doublespeak is not something future, it is here now. That which is good, make it evil, and that which is evil, make it good, a reversal, black is white, up is down and right is wrong. Destroy the meaning of words, bring in other meanings. To a communist, the word peace means all non-communists have been eliminated. It does not mean coexistence with other points of view. We are here. Indeed He has. If you mock Him who has spoken from the heavens, it will not go well for you. Did the prophecies of the Boar prophet come true? Well, not exactly, but very close – so why not exactly? Well the story goes that Germany’s Merkel had read the prophecies of the Boar prophet and went to the government and warned them – so the itinerary of Mandela’s laying in state and burial were altered, it is claimed, so as to thwart the prophecies and thus preserve the peace. It is my understanding, however that the original plans for Mandela were in fact exactly as the prophecy stated – sort of like Israel’s remark that “this man must die in order to save Israel” type of thing. MOSCOW (Reuters) – Russia will begin deploying a new type of long-range missile in 2018 to replace a Cold War standby known in the West as “Satan”, a military commander said on Tuesday in a signal to the United States that Moscow is improving its nuclear arsenal. “MOSCOW, December 16 (RIA Novosti) – Russia confirmed Monday that it has deployed tactical ballistic missiles near its borders with NATO but said the move did not violate international agreements. So what happened to Ison? 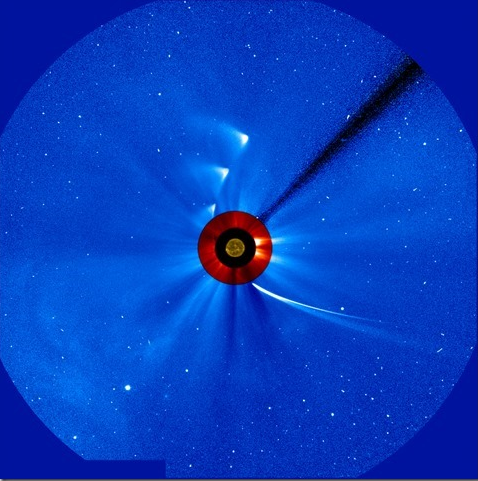 What is for certain is that the government is not saying and never will tell the truth even if they are saying – but it does appear that Ison did in fact break apart as it went around the Sun, and now they are calling it a ghost comet – if it is anything – so what does all of this mean as a sign? The pathway that Ison took through the heavens was a double message, one for antichrist, the other for Christ – Antichrist rising, and Jesus coming for His bride – which should be soon – but there is no question at all that Ison was a major warning of a soon to come event – the beginning of Daniel’s 70th week – soon, very soon, “are we there yet” type of soon – maybe April 11, 2014, or close to it, or maybe a warning that it all begins in2017 – we have to wait and watch. Then of course we have LOVEJOY II and what appears to be a torchlight parade through the cosmos – sort of like the MIDNIGHT CRY TORCHLIGHT PARADE. Around Thanksgiving, Love joy II was by Bootes, which means “the coming one” – and obvious reference to Jesus Christ for to collect His own. 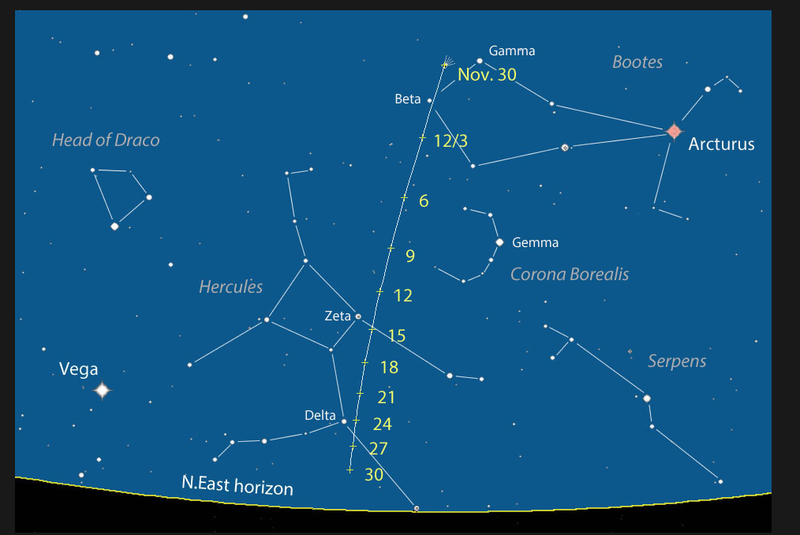 Around Christmas, Lovejoy will be in Hercules – also meaning the one who is coming and who will crush the head of Satan. Now of course LoveJoy I spelled out the entire salvation message as it went through the heavens – the strait gate, the narrow way, the death, the burial and resurrection of the true believer – the only way there is to KISS THE SON and survive – and also a message to the Kings and Rulers of the Earth to do likewise or perish – but they have evidently chosen to perish. So are all of these star signs just a coincidence? I doubt it some. I suppose you all heard about how our really sick and evil Congress cuts the veterans benefits, but found a way to fund Illegals at the same time. Sick, perverse, evil to the core, just as the Bible said the leaders of Babylon America would become – send your boys and girls, your sons and daughters, your husbands and wives off to war and then leave them dead or wounded and broken all over the landscape and refuse to help them – there is a solution to it all – you round up the entire Congress, the White House, the Justice Department, the Supreme Court, FEMA, the DHS, and send them to a North Korean gulag – or to the front lines to be slaughtered – I would imagine there would be changes made by them if and when they came back to resume office. We are corrupted to the point of no return – and judgment is soon going to fall upon us in a much bigger way than it is no way to stop it now. Their tables are full of vomit, the Bible says of our leaders. I love how blunt the Lord is. Indeed, how sick can these people get, but then, they would all be reelected by a very sick and perverse Babylonian population – so who is to blame really? And did you see the attack upon the supplement industry – granted there are a few bad apples in every bushel, but wow, this was really a major attack – in preparation for the Codex rules that will soon be here – where you cannot by any minerals, vitamins or food supplements unless you go to a doctor and get a prescription – you see the medical complex is all about money – and the medical complex wants all of it.These attacks omit scores of tests from Europe that conclude just the opposite. But make no mistake, CODEX will be here – and soon you will not be able to get any mineral, vitamin or food supplements of any kind, unless you go to your doctor, who may or may not be able to see you at all because of ObamaCurse. So be warned, and get what you can while you can. And by the way, you might want to keep an eye on Obama and the Pope. It seems that this current Pope is a “man for everyone” just as Obama was presented to the world. He is busy breaking down all barriers to all faiths, and bringing everyone under the same roof – Rome. Not to be outdone, even anyone who follows their conscience goes to heaven. Last time I checked, I don’t think that agrees with the Lord Jesus and His Good Book. And then again, Obama seems to be someone who accepts everyone as well, except Christians and those who wish to abide by the Constitution – but he loves America’s sworn enemies – Makes one wonder about the Bible’s Antichrist and False Prophet. The second coming of the Lord being a jubilee year (2017 IS A JUBILEE YEAR), it’ll cause the borders of South Africa to extent beyond Zimbabwe and Namibia. Striking details in his dreams and prophecies are known, and symbols reoccurring in his visions are consistent and can be with relative ease correctly interpreted. And on the morning of the 8th September 1925 he told his daughter, Anna, that he sees a black being released from prison in the distant future, visit Russia, and on his return the country will be thrown into chaos under his rule. (This could be either Mandela or Mbeki). However, it is only after the violent death of a black leader and a massive strike cripples the country that real trouble starts. The black leader will lie in state on Church Square in Pretoria, while people will flock there in their thousands to ‘pay their last respects.’ Nicolaas said: “The body of the king (black leader) is placed in a glass coffin and he lies in state on Church Square, Pretoria, for seven days. Mourners come from all over the world to pay homage to this king. Nobody worked for seven days, for people moved past the coffin day and night, fell on it and wept bitterly and could not be consoled for seven days. On the eighth day he is buried in Heroes’ Acre (A special place in the old cemetary in Pretoria reserved for statesmen). Nicolaas (Seer) says: “I see a coffin being lowered into a grave. Fires emerge but one great fire emerges in front. Naked people appear. In another part of the book, Nicolaas also speaks of this oppression until the Boers take matters into their own hands, a bucket of blood valls over, drenching what we call the ‘blood flag’ (a vierkleur like my avatar) and this is hoisted over a now free nation. So we watch, but it appears that the death of this man is another SIGN that the end is approaching rapidly, and seems to concur with all of the star signs and Earth signs we have been given of late. This appears to be a type of domino effect – where one event leads to another and another. Regardless, we are now seeing changes all around us, and they are accelerating rapidly. BIRTH PANGS. So, we have to watch closely now to see what develops. “Game-changer: Saudis seek to re-balance Mideast against U.S. Such nice people we now have in power – I wonder what the elite would think if abortion was made retroactive and all of them were aborted. Here is my blather for today – hope all of you are well out there in La La Land, otherwise known as THE PIT WITH NO WATER, AKA Babylon The Great, You might want to look that up some time to get the drift of the Lord. That GOOD BOOK. What you see to appears as a «delta-like» shape is in fact the side view of a CONE. So here we go, we are in grave danger and as i can see, the prophecy of Isaiah 14:12-15 is very on the making to me now. You can see that ISON’s is now ELECTRICALLY CONNECTED TO THE EARTH (the electric field are the doted lines starting from each planets or celestial objects and traveling with these objects. 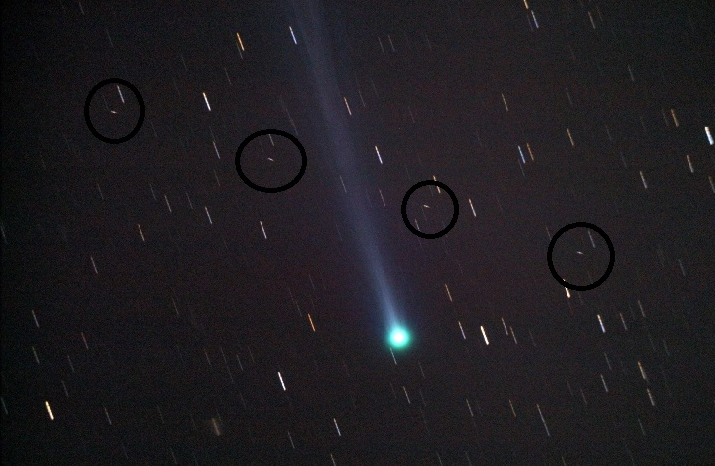 So you can see that this doted line created by ISON connected with the Earth doted line when it reched it ! And since that time, iboth lines remained together, which means an actual electrical connection. As it happened, noticed the apparent ISON’s direction change. It seems that ISON is now approaching to the Earth close than was it was expected! I hope this will be helpful for you ! 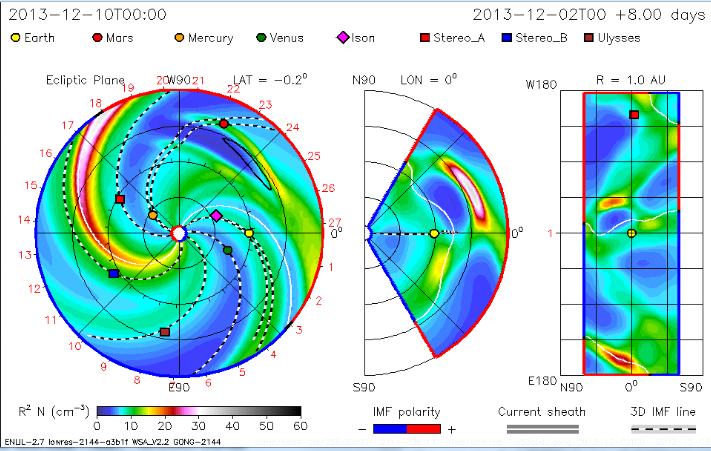 · Newark Airport destroyed by solar event, 32,000 dead. · Nuclear Terror Attack in New York confirmed. Is what happens in New York City and Newark part of Ison? Could this be true as well? Makes one wonder, does it not? So then it appears that the government is hiding something – but for what reason? As of yet, we do not have trajectory information changes either – but that should be coming out in a few days – then we will know if it is headed our way for any sort of impact event – or a green haze event, or a whole lot more – or nothing at all – so we wait, we pray – but how is anyone worthy to stand before the Son of Man? Anyone. Just wondering…. “Benjamin Netanyahu met Pope Francis on Monday as part of his visit to Rome, where the pontiff called for progress in Israeli-Palestinian peace talks. PEACE, PEACE, WHEN THERE IS NO PEACE – For the Son of Man, the Desire of the Nations is the only one who can bring peace to the world – of course, we cannot forget that ANTICHRIST will attempt the same thing – via a PEACE TREATY WITH MANY. So the mystery builds – will it all come together by April 11th. 2014? If so, we are going to see some serious stuff between now and then – but always remember the Lord can put up His hand and say “not yet, not quite yet – close, but not yet” Are we there Papa? And then of course we have all of these earthquakes going on and the volcanic awakenings all over the world. Can we all say MAGMA RISING? Rifts, sinkholes, mudslides, land changes, land inundations, lands rising. It’s the NEW NORMAL. You know, it’s all normal, but it is new. I would love to give the Pastor of this church in Virginia three cheers. our reading at verse 13, and go through verse 27.
went on until their money ran out, and they were hungry again. grain, and verse 17 says that only took them through the end of that year. him, in return for grain. to be our provider is to also become our master? from their GOD, even they too became slaves in the land of Egypt . I also tell you a great truth today, and an ominous one. government, and as slaves to their leaders. Lord, You alone are worthy to be served, and we rely on You, and You alone. And all of God?s people said amen!